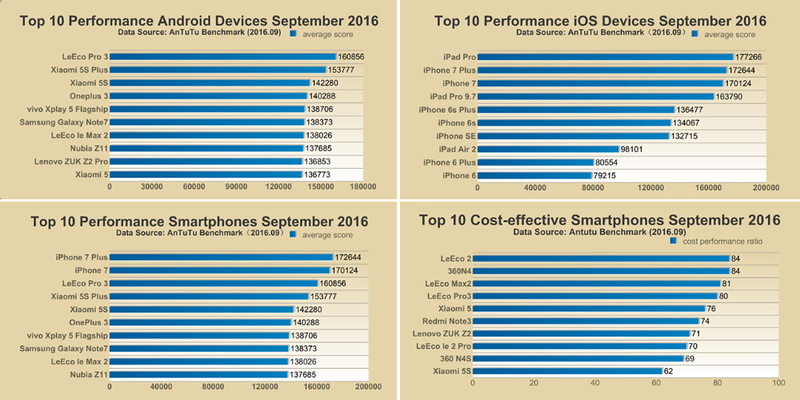 AnTuTu, famous company that develops benchmark software, recently presented a list, dated September, which shows what are the best cell phones in the market in 2016, mainly from the point of view of performance and price/quality ratio of each smartphone. Obviously, these data is based on the benchmark points obtained by the company's own software and therefore we can not speak of absolute statistics, although we talk about a good representative technical to know the performance of each device, and serve to show all the possible choices to the consumer potential in a very interesting position to get all the information of the current market situation. Let's start with the ranking of the best performance devices; AnTuTu has made a complete list of phones available in the market, without focusing on a particular operating system, but taking into account all available operating systems. However, we can find two separate lists that break down what are the best devices with iOS and Android. In the overall standings, the podium is for the iPhone 7 Plus, the iPhone 7 and the LeEco Pro 3. Here is the first big surprise to many, the third place. As for the Android world, in essence, the owner and master of the podium is the new CPU Qualcomm Snapdragon 821, which has given the first place to the LeEco Pro 3, followed by the Xiaomi 5S Plus, in both cases with a 6 GB RAM support. As for the best iOS devices (which also include tablets), first we found the iPad Pro, followed fairly predictable and logically by the iPhone 7 Plus and iPhone 7. Turning to Android, by contrast, the top led by LeEco Pro 3 and Xiaomi 5S Plus is completed with the Xiaomi 5S (but also point to OnePlus 3 in the fourth place). Last but not least, we have a ranking of the best smartphones considering the quality/price ratio: the podium is composed of LeEco 2, the 360N4 and LeEco Max 2. However, as can be seen in the list (just below this paragraph), it is very interesting that all positions of the latter Top 10 are occupied by Chinese smartphones, a sign that the oriental country is standing out increasingly in the sector.